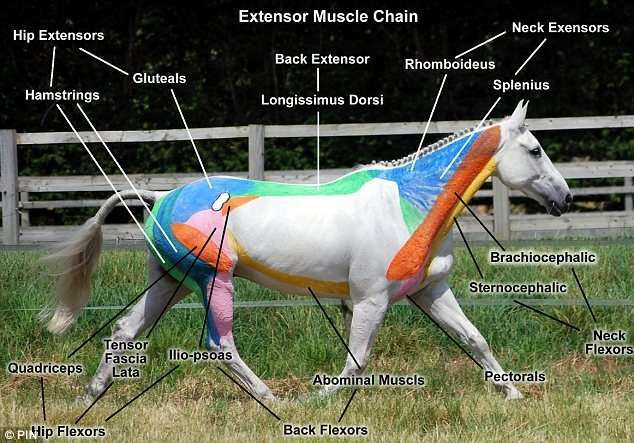 With 205 bones and 700 muscles the horse is a challenging animal for anatomy students to study. That was until champion rider Gillian Higgins came up with the novel idea of showing people how it all works. Rather than bog them down with dusty diagrams and skeletal sketches, she hit upon the idea of painting the inner workings of the horse on the beast itself. Now veterinary students, race horse trainers, eventers, pony club members and dressage judges are flocking to her lectures to see the horse painting in action. Ms Higgins uses water-based hypoallergenic paints which are easy to wash off afterwards. 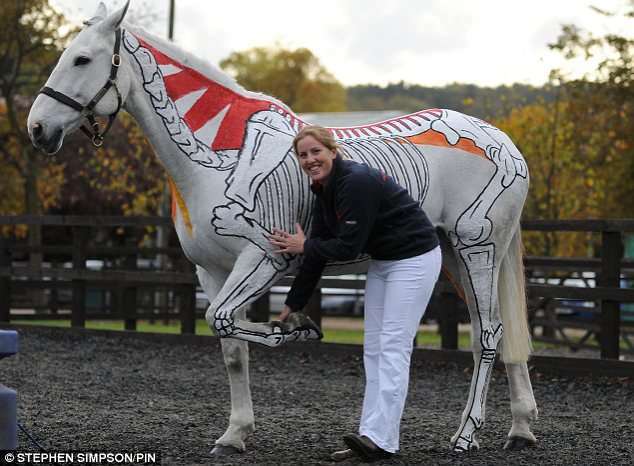 She takes four hours to apply the equine make-up - painting the skeletal structure on one side and the multi-coloured musculature on the other. 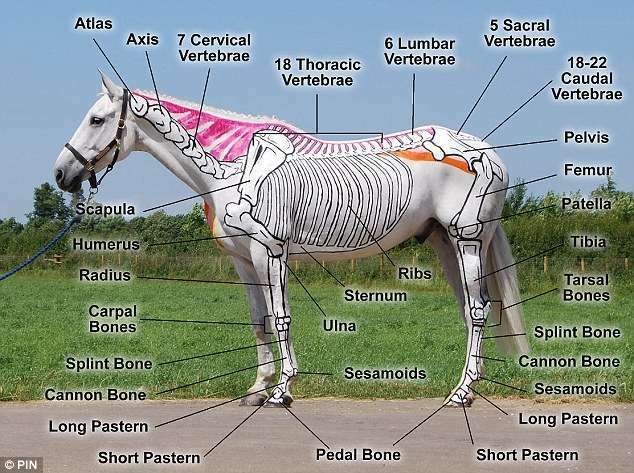 'Painting the skeleton and musculature on the side of the horse really helps to bring the subject to life,' she says. Gillian, 27, a sports remedial therapist, from Nottingham, first hit on the idea three years ago after completing a degree in equine business management at the Royal Agricultural College in Cirencester, Gloucestershire. She said: 'I realized that many riders and trainers could benefit from a better understanding of how the horse works. With all those bones and muscles with incredibly long names, it can be a bit much to take it all in. 'I'm trying to show the anatomy and how the horse works in an interesting and easy to understand way. Normally her models are her 12 year old eventer Freddie Fox or six year old Henry - although if she travels further afield from home she relies on schools and colleges to provide a steed for her. Greys are best because the colours show up more clearly. Gillian, who won a gold medal at the student riders nations cup in 2006, said: 'Freddie Fox is the best model because he has just the right temperament and loves to be the centre of attention at the demonstrations. Being painted isn't much different for them as being groomed or handled. They don't mind at all.